Tank McNamara takes on a large issue in sports, which has to do with integrity and idealism and hypocrisy. But I also remember kids selling football pool slips, and, specifically, one kid who was practicing for the role in “Good Fellas” as young Henry. There was a sense that those slips supported organized crime, in part because they certainly did and in part because anything beyond the office pool was considered shady. However, we also didn’t have state lotteries in those days. Times change and we’ve nearly run out of vices, which forces us to go through old yearbooks and law school applications to find them. My objection to sports gambling is not the morality of it but the way it changes the proposition from who is going to win to who is going to cover the spread. People will cheerfully root against their home team if they’ve got more fantasy players on the other side of the ball, and I don’t much care whether they reinstate Pete Rose because fantasy leagues have shifted baseball, and nearly football, over the line to join with jai alai and horse racing as sports where the point is for the spectators, not the athletes, to win. A couple of pretty good cartoons diminished by odd timing. I laft over “In the Bleachers,” because, as much as pre-game singers want to add some creativity to their performance, the show-off portion of the National Anthem remains on that word “Free,” and the audience, little as they may care about the song in general, want to hear that traditionally dragged-out syllable. The timing on Luann is more internal, in that she’s in her second year of college, and it seems unlikely she’d be having her first cup of coffee at this point. Admittedly, I was early to the beverage, having had my first cup in the Fire Hall at home during some dogsled races when I was 12 or 13. The dogsleds go off and then you stand around until they come back, which isn’t soon, and this was a particularly cold day, so my folks took pity on me. But then I started drinking the stuff on a daily basis at 15 or 16. As did Jeremy in one of my favorite Zits strips, this from 2004. Maybe this is the first time Luann tried it homemade, straight up. In lieu of more blackface cartoons, I offer this Saturday Morning Breakfast Cereal, which covers much of the same ground. Let me take that back: It covers all the same ground. Even as Dad, long before I was Grandpa, I stopped reading “Dr. Doolittle” and “Mary Poppins” to the boys part way through, and my mother admits she did some judicious on-the-fly editing when she read them to us even earlier. Don’t pretend we didn’t know, long ago. At five, at the height of the Davy Crockett fad, when Howdy Doody was on the air, decent kids knew to “catch a tiger by the toe,” whatever their little friends were saying. 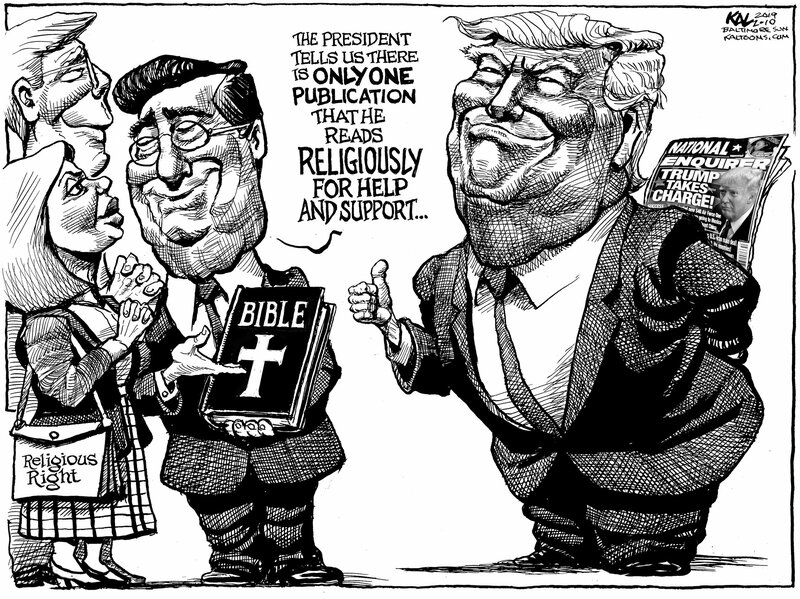 Kal exposes the hypocrisy of somebody or other. It’s an interesting proposition to sort out whether Trump is being more dishonest in even showing up at a Prayer Breakfast or the people there are being more disingenuous in pretending he belongs among them. There is a branch of Protestantism that preaches the Gospel of Prosperity, and Trump was raised in it, and that same diseased branch of Christianity believes that, once you have called on Christ, you’re set for life and can do anything you want, secure in the notion that your sins are forgiven. Judging Christianity by them is foolish, ignorant and possibly hateful, but it’s certainly not too judgmental to cringe when they speak and, especially, when they cite their religion as a reason to build laws around their perversion of the Message. 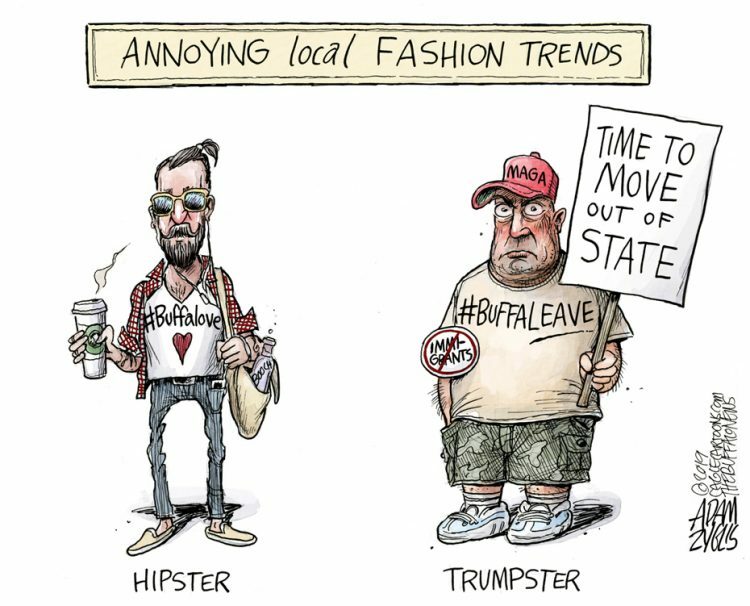 We ought not to expect logical consistency from anyone who believes Trump’s promise of bringing back coal mining, and who condemns Clinton for suggesting job-retraining instead, but is apparently comfortable with his advice to New York State residents, as illustrated by Adam Zyglis, to move to where the jobs are. Where would that be, Mr. President? Mexico? Taiwan? Maybe they could work in those new steel plants. But, in fact, he meant these great jobs he had arranged. How long are your suckers going to keep looking for the Queen of Hearts in your cheap three-card monte hustle? 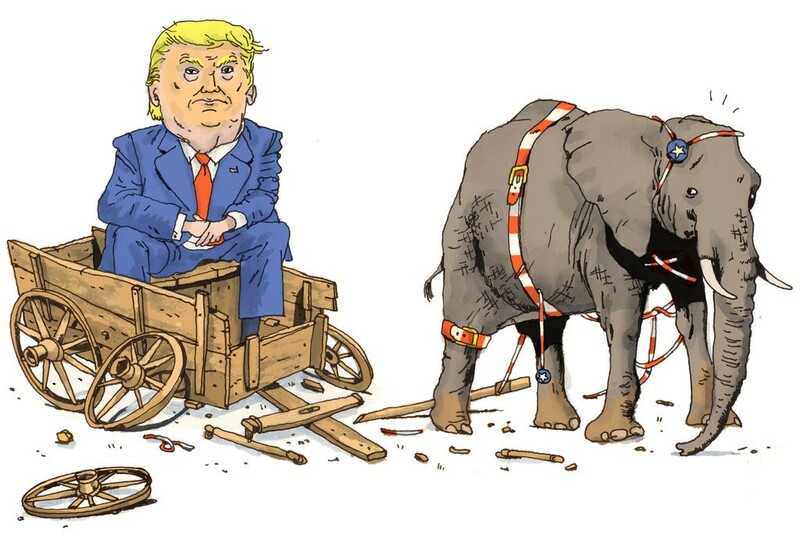 This piece by Victor Kerlow is not a cartoon, merely an illustration for an analytical essay in the NY Times in which a pair of conservatives call for Republicans to abandon Trump before he completely destroys their party, and nation. I came across it as a link in a similar article by Jennifer Rubin in the Washington Post. In better days, I found Rubin’s conservative columns annoying, but she has since made the transition from Saul to Paul and I don’t think it required a change in her viewpoint. And if that isn’t enough to get you through a second pot of coffee and the rest of the donuts, here’s a Daily Beast article about how Trump or at least the Trumplings may be facing RICO charges. Let’s hope they don’t all end up in the “I Told You So” file, along with the “Trump can’t win” stories we read with such optimism two years ago. Didnt have my first (and last) cup of coffee until I was well into my twenties. Now tea, on the other hand…..
George Will and I are now in agreement. I would have given odds that would NEVER happen ! On another of my lists, someone pointed out that Luann had “her very first cup of coffee” just over twenty years ago, and the current “her very first cup of coffee” just reused the same joke. 28 queries in 0.179 seconds.